Again and again, we understand that smaller living does not mean we have to sacrifice our conveniences. 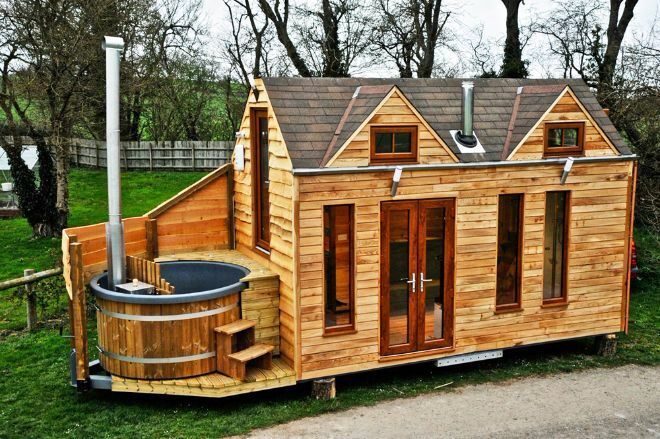 The builders at TinyWood Homes took this idea step further and feature log-fire hot tubs, BBQ heaters, and Gazebo options in their tiny house plans! They offer three different models that can be outfitted to meet your needs, including an option to make them mobile. We recently interviewed Aidan Reeve from TinyWood Homes to get his insider perspective on tiny homes and what sets TinyWood apart other builders. What makes you stand out in the tiny home market and what are you known for? TinyWood Homes create unique properties for the [vacation] rental market. We offer "Architecture in Miniature" - using luxury home appointments such as marble worktops, fitted kitchens, domestic appliances and gas heating & plumbing to create a sense of absolute comfort in an exciting and compact space. -The Family Teeny featuring King Size bed mezzanine, our own unique fold-down bunk beds and a sofa bed allowing for up to 6 berths. 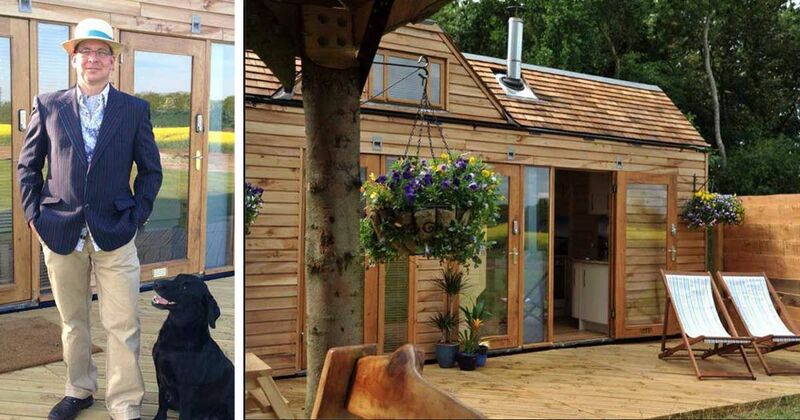 -The TinyWood House is available in 6 to 8 berths and is permanently attached to a trailer with removable wheels that can be moved around the owner's land using a tractor or SUV. The house also features an integrated hot-tub. All of our properties can be enhanced with the addition of our connected or stand-alone gazebo, log-fired hot tub and our own exclusive BBQ/Heater. Prices start at 7,000 GBP [$9,300 USD] for the Teeny and rise to 30k GBP [$40,000 USD] depending on accessories and appointments required. Without a doubt, it is the Family Teeny. 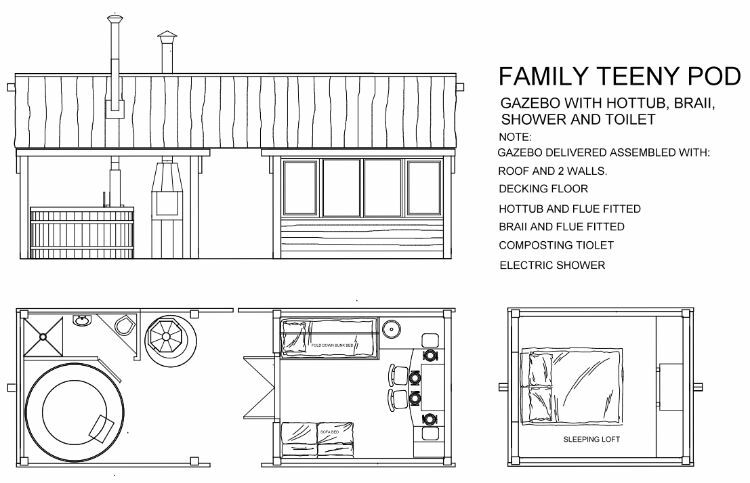 We wanted to create a practical space for a family of four who yearned to camp but required the additional practicality of proper beds, electricity, and running water. Adults love the comfort and space whilst children go nuts for our unique "hidden" bunk beds and the use of the kitchen seats and table as a legitimate climb to the bedroom ladder! Of course, as with all of our properties, it is fully insulated and fire-proofed for comfort and safety. 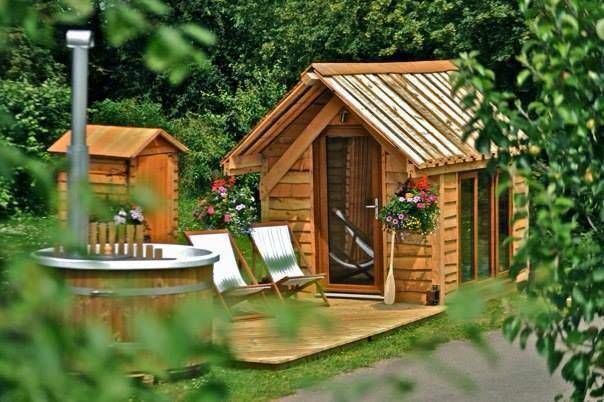 The addition of a separate wooden gazebo, hot tub, and composting toilet make for a great outdoor space without the hassle of tents, air beds, and soggy sleeping bags! We love the way the TinyWood House turned out - the upstairs full-sized king bed is a cozy, romantic nook! The integrated log-fired hot tub is great to step down into from the bedroom. Also, the ability to jack the property up and connect the wheels and move to a new spot is a great feature for landowners that want to change the outlook of the property - perhaps moving it to a lake in the summer, and nearer to home in the winter. We bring some unique designs to every property we create making the properties unique, practical and exciting! First, think carefully about how the property will be used. Do you need to make it mobile? If so, how will you move it? What about connected services like water and electric? Will it be structurally safe or even legal to tow? Planning is everything at this stage. Secondly, read all you can online - go to a tiny house building class - consult professional builders for advice. Mock up EVERYTHING in cardboard, pegs, and cheap lumber first to ensure dimensions will work for you. Whatever you set as your budget, add at least 25% contingency - probably 50% is more realistic! Make sure your house will pass all codes and regulations if you plan to live in it or rent to others. Remember, the process should be fun, but there will be dark days, and lack of progress. Use friends and family to cheer you on, change to a different part of the process or just take a break for a while. It's probably best if you don't have a deadline - you will almost certainly not meet it on your first build! But most importantly, never give up. I would love to do it, however, in the UK it is very hard to move into a small house as there are strict planning laws and land prices are high even for the smallest plot. But if you can do it, I am sure it is a great way to live and would be rewarding to live such a green, zen life of small carbon footprints and planned minimalism! There is no need to sacrifice comfort for space - our TinyWood house has proper beds, flushing toilet, and a proper shower. All in 26-foot by 8-foot space! !